J.C. Kinnaird & Son at Papple Farm at Haddington, East Lothian is run by John & Sheila and Andrew & Maxine Kinnaird. Andrew says, "We run 600 acres in arable cropping and beef. The 430 acres in crops comprises wheat, barley and WOSR. We have roughly 100 suckler cows with all progeny finished on farm at 15- 20 months of age using a barley beef system after summer grazing. 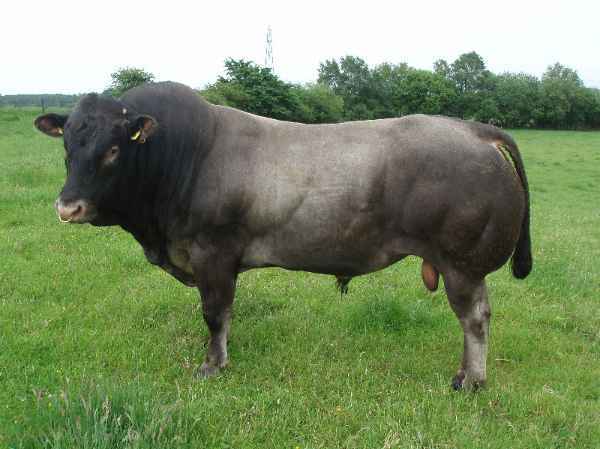 Our new stock bull at Papple is 5 year old pedigree Bazadaise bull Macford Duncan. He is our second Bazadaise bull. We liked the calves that our first Bazadaise bull left and so our reason for wanting another Bazadaise is for ease of calving, good killing out percentage and to use mainly on heifers but also on cows". Bred by Willie Crawford at Kirknewton, Macford Duncan started his working life with Ian Craig’s Sandrian Herd at Dumfries. Ian is retiring from cattle soon and that's why Duncan has moved eastwards again! 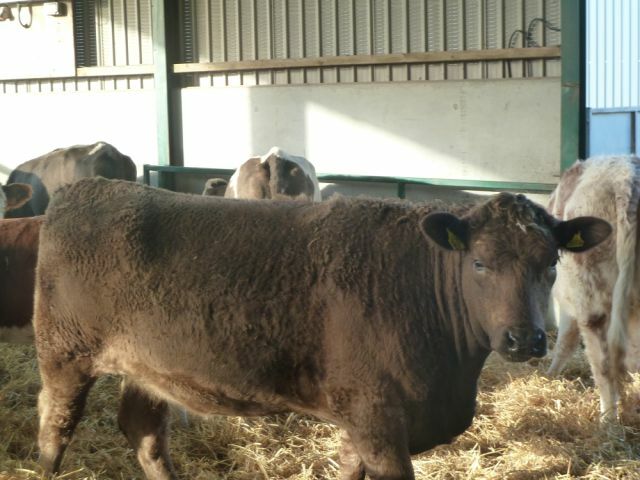 "We have mainly Simmental cross and some Angus cross cows and we liked the calves that our first Bazadaise bull left. These two SimX heifers are by our previous Baz bull and in calf to our current Baz bull. 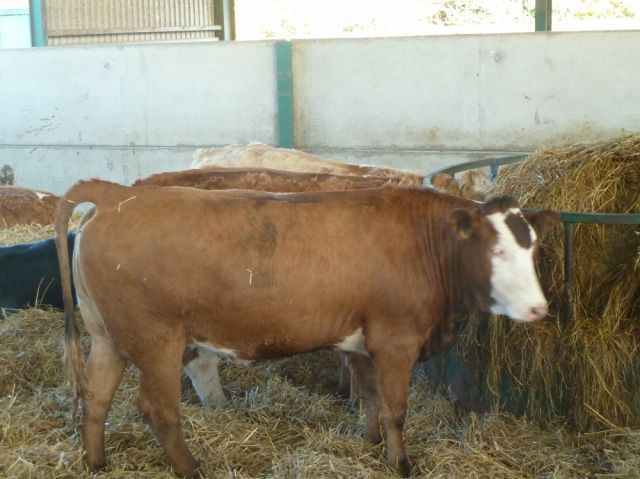 Our BazX incalf heifers will calve at 24mths. All finished stock are sold deadweight to AKS. We aim for a deadweight of 330kg plus. The BazX animals finished so far have mostly graded U4l. 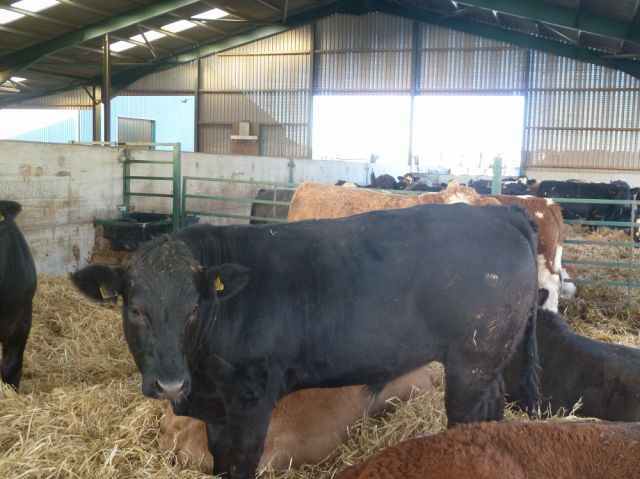 Our Simmental cross heifers and Angus cross heifers and some cows will be bulled by our Bazadaise bull and the rest will be put to our Simmental bull. These two finishing cattle are 2011 calves (photos taken October 2012). 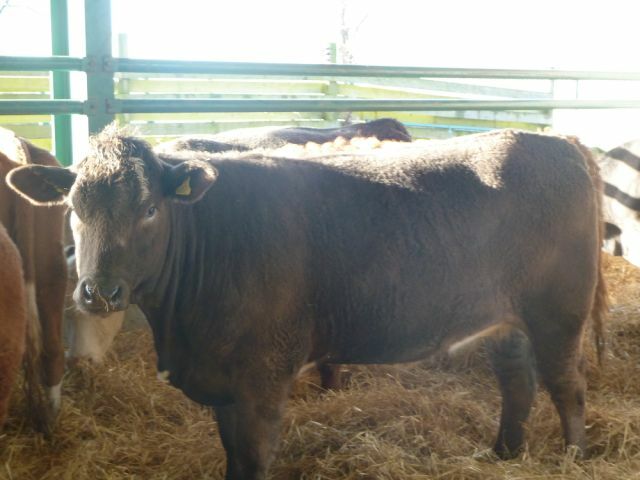 We recently killed a BazX bullock at 17 months old at 420kg deadweight!"